Think about your current sulky's. Are they worn out? Why? Chances are it's because of the almost constant contact with the ground. The daily wearing and tearing, banging and bending slowly destroys them. The unique design of the Bronco Rider places the "main frame" of the sulky over 4 inches above the ground, away from all of this wear and tear. Only the actual foot platform rides near the ground. So if it does become worn or damaged you can quickly and inexpensively replace only the foot platform. Important: Use of the DM-1 or SM-1 Sulkies are not suitable for use on the Scag Pro V mower. SAFE. Built in "yaw limiter" allows the foot platform to pivot up to 65° enabling "zero°" turns, yet prevents dangerous jackknifing. SUPER STRONG AXLES. 7/8" axles pass through the box tube frame and are located close to the junction of the two frame members for strength and rigidity. Axle support housings further strengthen axles and insure correct alignment even after extended use. NO FLEX FRAME. The "main frame" is an 11 gauge square tube, all-welded, reinforced steel structure with tremendous strength and rigidity built to withstand the day to day rigors of production mowing. Bronco Rider will provide season after season of dependable service with only routine maintenance. REPLACEABLE FOOT PLATFORM. Because of the unique design, if the foot platform becomes worn or damaged it can be replaced as a single, inexpensive part instead of replacing the entire unit. This design makes Bronco Rider superior to other sulkies which are constructed using a single piece of sheet metal. The large size and raised traction dimples assure a safe and comfortable place for the operator. SMOOTH RIDE. Large diameter 4-ply rated "Go Cart Tires" have almost 3 times the amount of rubber as some tires. These "Super Tough", extra H.D. tires practically end flats and other tire problems. Offset wheel hubs give you a choice of track widths by reversing the wheels. QUICK DISCONNECT. Disconnecting the foot platform from the connecting arm is accomplished by the removal of a single lynch pin, and the heavy duty mounting bracket bolts quickly and easily to mower (inset, top left). Many factors effect the operations of a sulky. Terrain conditions such as slope, ground type, ground moisture, etc. are all factors. The mower being used to pull the sulky is obviously a major factor. Generally, the larger the mower, the less effect the sulky will have on the mower's operation. Operator weight and operating style also have an effect. Proper mower setup such as tire pressure, deck pitch/weight balance and drive adjustments become very critical. We recommend a minimum mower size of 48" (preferably with hydro drive) for the Bull Rider sulky. Although operation is satisfactory on smaller mowers the factories above should be carefully considered. The Bronco Rider sulky can be used behind most 36" and larger mowers with excellent results. It is the user's responsibility to make certain the sulky suits the mower on which it is installed. A mounting bracket which attaches to the lawn mower's motor frame connects the sulky to the mower. 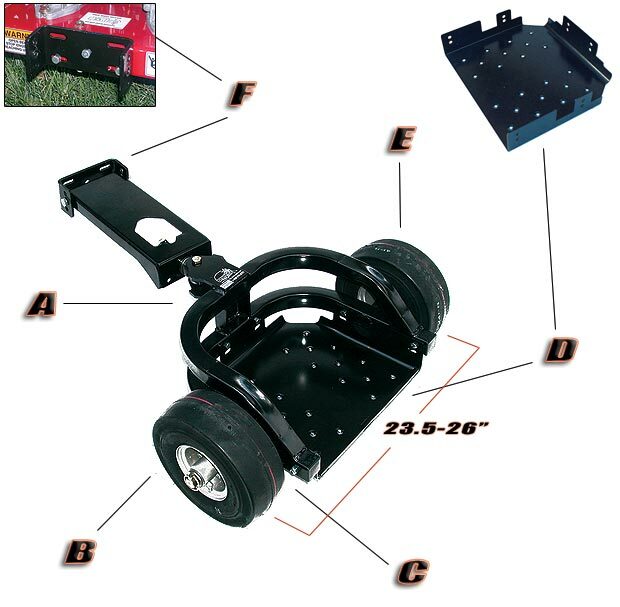 Most mowers currently on the market are sufficiently strong in this area; however some mowers, such as the Ferris dual drive require an optional reinforcement plate to further strengthen this area. It is the user's responsibility to make certain that the optional reinforcement plate is installed on any mower where strength of the motor frame is in question. TrimmerTrap part no. SP-43. Important notice regarding solid filled tire use on sulkies. Solid filled tires are certainly much better than they were years ago. It is our opinion however that filled tires do not duplicate “air” filled tires. They are defiantly heavier and also ride harder than pneumatic tires. Because of an increase in rolling mass and less shock absorption filled tires can cause increased stress and strain on components. TrimmerTrap will not warranty parts if filled tires are used.